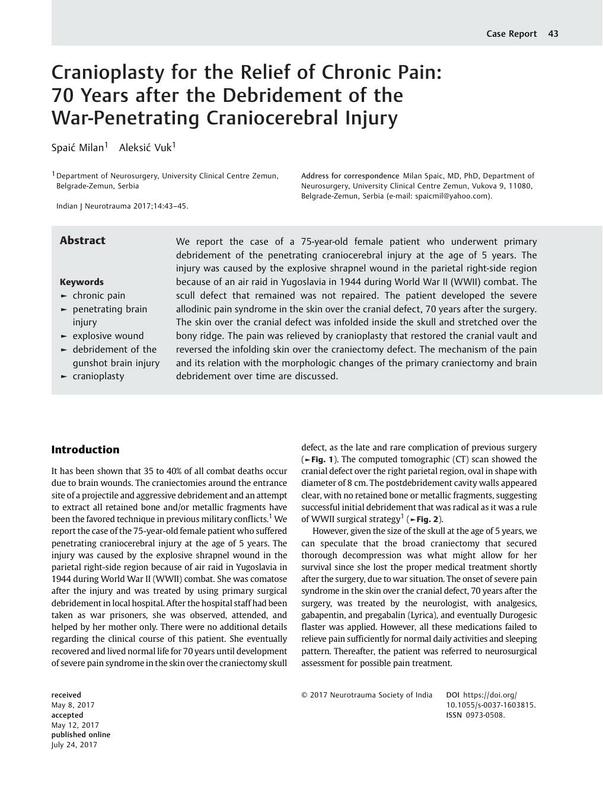 We report the case of a 75-year-old female patient who underwent primary debridement of the penetrating craniocerebral injury at the age of 5 years. The injury was caused by the explosive shrapnel wound in the parietal right-side region because of an air raid in Yugoslavia in 1944 during World War II (WWII) combat. The scull defect that remained was not repaired. The patient developed the severe allodinic pain syndrome in the skin over the cranial defect, 70 years after the surgery. The skin over the cranial defect was infolded inside the skull and stretched over the bony ridge. The pain was relieved by cranioplasty that restored the cranial vault and reversed the infolding skin over the craniectomy defect. The mechanism of the pain and its relation with the morphologic changes of the primary craniectomy and brain debridement over time are discussed. This article has never been submitted, published, or reported elsewhere. All authors approve the article for publication.